"Banana smoothie is always readily accepted and it usually doesn't take long to put on some weight and move them to the flight aviary to recuperate with our other batties in care," said a spokesperson on the group's Facebook post. Bats help control insect populations – they’re frequently used as natural mosquito control and aim farmers in protecting their crops from pest infestations. Not to mention, bats are also vital pollinating species. We are well aware of the fact that bees make many of the foods we eat possible, and that they are in decline, but we rarely discuss the role bats play in making some of our favorite foods possible. After all, we can thank them for avocados, mangoes, dates, and many others. Unfortunately, just like bees, bats are endangered by human interaction and their population is dropping dramatically. Thankfully, there are many dedicated people who refuse to let bats fade into obscurity, like the wonderful person who is caring for this rescued flying fox. This little one appeared malnourished and lost when he was found, so this kind trained rehabilitator is making sure he gets all the care he needs so that one day, he can return to the wild! 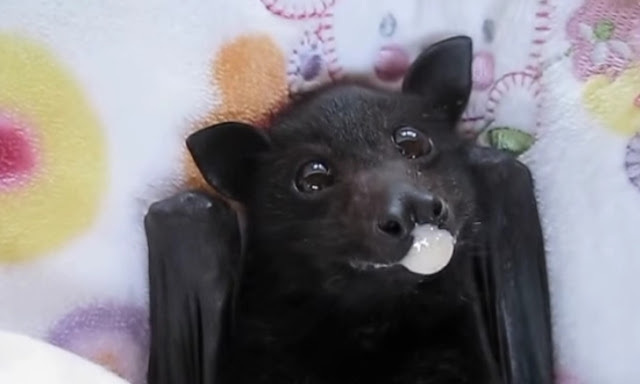 Responses to "Nursing a Rescued Flying Fox: Precious Baby Eating a Banana Smoothie"